Brad Mehldau Trio: Rebuilding 'Wonderwall' With this live version of "Wonderwall," Mehldau reduces Oasis' most famous song to a post-bop stride-piano exercise. Few jazz groups maintain a stable lineup for very long, let alone more than 10 years. This high turnover rate is a relic of jam sessions and rent parties, as well as the product of simple logistics, from musicians' availability to the desired artistic needs of composition and performance. So when the long-standing lineup of pianist Brad Mehldau's trio changed — original drummer Jorge Rossy moved on in 2005 — it was apparent how rare and special that partnership had become. 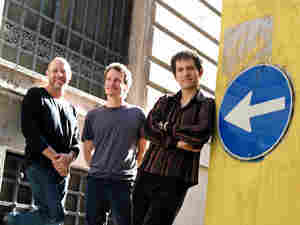 Still, the addition of drummer Jeff Ballard has reinvigorated the Brad Mehldau Trio's musical dynamic. Mehldau, Ballard, and bassist Larry Grenadier sound unusually lively and exploratory on the two-disc collection Brad Mehdlau Trio Live, and they seem to play with a greater-than-ever sense of urgency. While this isn't the first time the pianist has mined the Village Vanguard for performances — three of his five "Art of the Trio" records were recorded at the famed New York jazz venue — Live is the finest live recording Mehldau has made. Collected from a series of 2006 concerts, these performances return to what Mehldau and his band do best: conversational improvisation, with idiosyncratic arrangements that rethink the popular songbook. Mehldau's equal attention to standards, original compositions, and modern-rock covers has established a cohesive repertoire that allows set-list staples ("The Very Thought of You") to feel right at home alongside a 23-minute rendition of Soundgarden's "Black Hole Sun." With "Wonderwall," Mehldau reduces Oasis' most famous song to a post-bop stride-piano exercise. The melody, condensed into its most basic elements, rhythmically attacks in short bursts, set over Grenadier's sturdy bass patterns and Ballard's broken drum grooves. As Mehldau's solo motifs drift further away from the song's structure, the group develops an intertwined momentum that seems prearranged while obviously crafted on the spot. By the time the familiar refrain returns, it's jarring and thrilling to hear how much the song and the musicians have evolved. This story originally ran on Apr. 2, 2008.